The global retort pouch market is choc-o-bloc with keen players trying to stay ahead of the curve through cost-reductions and improved products. This makes the competition stiff in the market. Serving to boost the market is the busy lifestyle of people worldwide, which has upped the demand for ready-to-eat food products for which the most preferred packages are retort pouches. 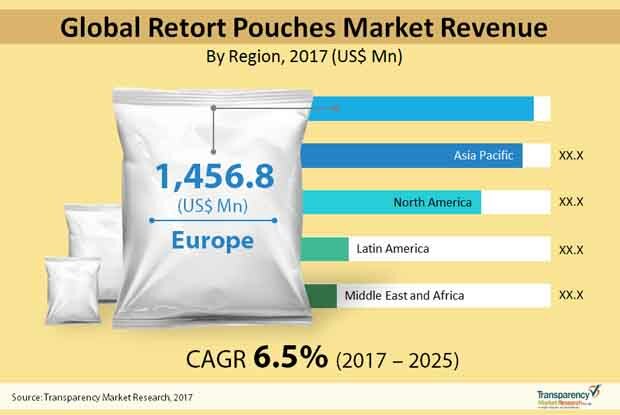 Various keen companies’ efforts to churn out more sophisticated and eye-catching products is also catalyzing growth in the global retort pouches market. Retort pouches are supplanting cans in the food packaging industry because of their ability to prolong the shelf life to the product. Recyclability issues of retort pouches, on account of the multi-layer materials used in them, however, is posing a challenge to the market. According to Transparency Market Research, the global retort pouch market will likely rise at a steady CAGR of 6.5% from 2017 to 2025, to pull in a revenue of US$7.51 bn by 2025 from US$4.29 bn in 2016. The global retort pouch market can be segmented based on different parameters. Depending upon material type, for example, the market can be classified into aluminum foil, polypropylene (PP), food cast PP, polyamide, and polyethylene. The polyethylene can be further segmented into HDPE, LDPE, and LLDPE. At present, the segment of aluminum foil is highly popular in developing countries, while polyamide is seeing substantial uptake in developed continents of Europe and North America. The TMR report predicts the aluminum foil segment to register a CAGR of 6.7% from 2016 to 2025. The PP and food cast PP materials are also expected to gain considerable market share in developed pockets in Asia Pacific and Europe. Polyamide and polyethylene materials, on the other hand, will see slower uptake for making retort pouches due to health hazards posed by them. From a geographic standpoint, Asia Pacific leads the market in terms of growth rate. By rising at a 7.5% CAGR in the forecast period, the market in the region is projected account for a dominant share in revenue – about US$2.54 bn – by 2025. The annual consumption of retort pouches is expected to touch 12,176 million units by 2025-end in the region, which currently holds 31.3 % share in the market. Asia Pacific’s dominant position is mainly a result of soaring demand for safe and hygienic ready-to-eat meals and pet foods in the region. Europe, again, is a key market which currently holds a dominant share in the overall revenue. By clocking a 5.9% CAGR in the forecast period, the market in the region will likely lose some of its share in revenue to become worth US$2.30 bn by 2025. Vis-à-vis volume, the market in the region will likely register a CAGR of 5.5%. The Middle East and Africa is predicted to be a fast expanding market too along with South America. The market in North America is expected to register a healthy CAGR of 5.9%, over the forecast period to reach US$ 1,829.5, by the end of 2025. Some of the key players operating in the global retort pouch market are Sealed Air Corporation, Huhtamaki Group, Amcor Ltd., Mondi Group, Bemis Company, Inc., Clifton Packaging Group Ltd., Foshan Nanhai LD Packaging Co., Ltd., Sonoco Products Company, Constantia Flexibles International GmbH, ProAmpac, Alliedflex Technologies Ltd., Flexi-Pack Ltd., Flair Flexible Packaging, Tong Yuan Packaging Co. Ltd., Purity Flexipack Ltd., MST Packaging Co., Ltd., and Avonflex. This report provides forecast and analysis of the retort pouches market on global level. It provides actual data of 2016 along with estimated data of 2017, and forecast data up to 2025 in terms of revenue (US$ Mn) and volume (Mn Units). The report also includes macroeconomic indicators along with an outlook on retort pouches consumption pattern across the globe. It includes drivers and restraints of the global retort pouches market and their impact on each region during the forecast period. The report also comprises the study of current issues with end users and opportunities for retort pouches manufacturers. It also includes value chain and pricing analysis. In order to provide users of this report with comprehensive view of the market, we have included detailed competitiveness analysis and company players with their SWOT analysis and strategy overview. The dashboard provides detailed comparison of retort pouches manufacturers on parameters such as operating margin, total revenue, and product portfolio. The study encompasses market attractiveness analysis by capacity, by barrier material type, by application, by product type, by closure type, and by region. TMR triangulates the data via different analysis based on supply side, demand side, as well as dynamics of retort pouches market. The report includes consumption of retort pouches and the revenue generated from sales of retort pouches across the globe and key countries. By barrier material type, retort pouches market is segmented into Aluminium foil, Polypropylene, Food Cast PP, Polyamide, and Polyethylene. Polyethylene is further subdivided into HDPE, LDPE and LLDPE. By Capacity, retort pouches market is segmented into 0 ml- 350 ml, 351 ml- 500 ml, 501 ml- 1000 ml, 1000 ml- 3000 ml and above 3001 ml segments. By product type, retort pouches market is segmented into stand up pouches, zipper pouches, spouted pouches, pillow pack and 3- side sealed pouches. By Application, the market is segmented into food and pharmaceuticals and others. By closure type, retort pouches market is segmented into with cap and without cap. With cap is subdivided into screw cap, flip cap, flip top cap, pour spouted cap and, others. And without cap segment is subdivided into sealed, zipper/ziplock, and others. By application, retort pouches market is further sub-segmented into pet food, baby food, meat & seafood, fresh produce, ready-to-eat meals, soups & sauces and others. Market numbers have been estimated based on extensive secondary and primary research, average pricing of retort pouches by capacity and the revenue is derived through regional pricing trends. Market size and forecast for each segment have been provided in the context of global and regional markets. The retort pouches market has been analyzed based on expected demand. Prices considered for the calculation of revenue are average regional prices obtained through primary quotes from numerous regional retort pouches manufacturers. All key end users have been considered and potential applications have been estimated on the basis of secondary sources and feedback from primary respondents. Country demand patterns have been considered while estimating the market for various end users of retort pouches in the different regions. Bottom-up approach has been used to estimate the retort pouches market by regions. Global market numbers by barrier material type, by capacity, by product type, by closure type, by application have been derived using the bottom-up approach, which is cumulative of each country’s demand. The same has also been validated from top-down approach. Company-level market share has been derived on the basis of revenues reported by key manufacturers. The market has been forecast based on constant currency rates. The report provides detailed competitive and company profiles of key participants operating in the Global market. Key players in the global retort pouches market include Sealed Air Corporation, Huhtamaki Group, Amcor Ltd., Mondi Group, Bemis Company, Inc., Clifton Packaging Group Ltd., Foshan Nanhai LD Packaging Co., Ltd., Sonoco Products Company, Constantia Flexibles International GmbH, ProAmpac, Continuous Retorts limited (CRL), Alliedflex Technologies Ltd., Paharpur 3P, Flexi-Pack Ltd., Flair Flexible Packaging, Tong Yuan Packaging Co. Ltd., Purity Flexipack Ltd., MST Packaging Co., Ltd., Clondalkin Group Holdings B.V., Avonflex.